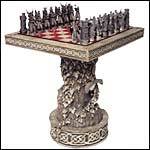 Medieval, Renaissance and Modern Collectibles - Miniatures - Chess Sets - Collectibles and Gift-ware. Knights of The Round Table - Fine pewter set of King Arthur and his Knights of the Round Table. Western Badges - Law Enforcement Badges from the Wild Wild West! Our Sheriff Badge hearkens back to the days of the classic Old West. This sheriff's badge features a classic six pointed ball tipped star is constructed of cast metal and embedded with solid mounting pins. Copyright © themysticalmall.com 2019. All Rights Reserved.